Native to the Alps and Pyrenees, where their population is monitored and controlled to prevent their decline. Black wormwood is used to make genepi, an aperitif like absinthe or chartreuse, which is taken before or after meals to help to stimulate appetite. Génépi is made by infusing vodka or pure grain alcohol with black wormwoods flowering tops, then putting it through a distilling and ageing process. The product is pale gold in colour. French elixirs were originally ritualized by Carthusian monks studying in the French Alps. Today they are served to skiiers and other mountaineers in the Alps, and they flow about many social circles—sometimes served in a grolle (coupe de lamitie) with coffee and citrus. 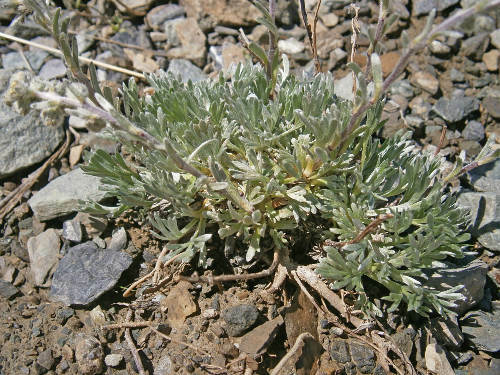 Black wormwood is a low, mat-forming plant, with grey felt-like leaves. Excellent for rock gardens, natural to rocky mountain cliffs, and tundra. Ht 1ft.